Whenever the transition from winter to spring begins to occur, I greet it with incredulity. But how? Less than two weeks ago, the city was coated in snow. 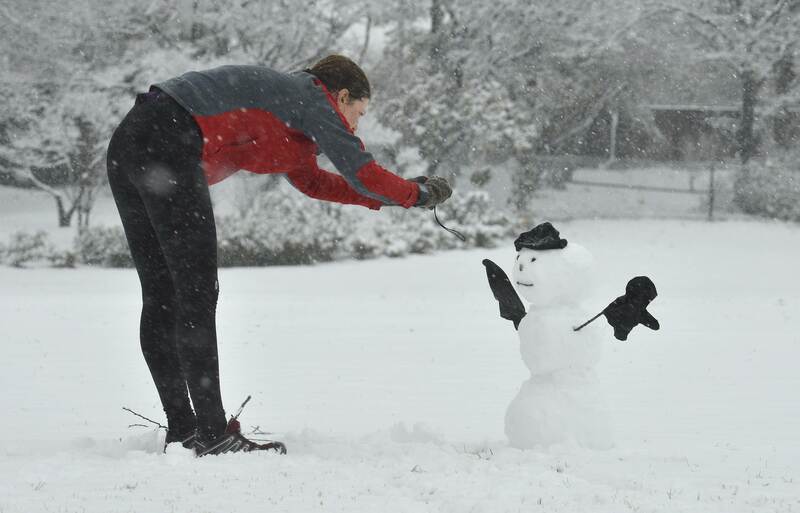 Ten days ago, I made a snowman during a snow day run. A UPI photographer even caught me in the act. Since then, the white stuff has melted and winter moved out of the way– just in time for the running of the D.C. Rock ‘n’ Roll Marathon. I always wonder how my body will hold up to running 26.2 miles in March. Generally, I have a tough time hauling myself outside in winter months compared to the warmer, brighter days of spring and summer, but a long run that routes exclusively through the city is impossible for me to resist. The D.C. Rock ‘n’ Roll organizers have plotted out a thoughtful marathon course. Each year, the run passes through all four of the District’s quadrants, and the organizers aren’t afraid to send its participants over hills. My favorite parts of the 2015 route included going up Harvard Street and around Howard University in Northwest, going into Southeast through Anacostia Park, rising into Fort Dupont, and the signature finish via Minnesota Avenue (also a hill). The Pi Day edition of this event featured moderate temperatures and steady rain. So much rain! It was definitely the wettest run I’ve done, and made me grateful for all the rainy brevets Felkerino and I have ridden over the years, which have taught me a thing or two about dealing with less-than-ideal weather and dressing accordingly. Temperatures remained mostly in the fifties but the rain and cloudy skies meant a lower “real feel.” In anticipation of the weather, I chose my lightweight trail runners with some wool socks– a combination I hoped would keep my feet warm, but also drain water. I dressed in a sleeveless Nuu-Muu (which is basically a running tunic) with shorts, and a long-sleeve lightweight wool base layer. I also wore gloves for the first ten miles. This combination seemed to work well for most of the day. When I made the turn for the second half of the course, I didn’t feel any doubt about continuing. My body never tightened up on me and I felt starry-eyed for much of the event. I did not mind the hills; I think varied terrain makes a course more interesting and increases my sense of accomplishment. I approached the Rock ‘n’ Roll marathon as a whatevering-plus run. It was a once-a-year treat to tour the city and see places I seldom visit. It was awesome to see runners taking over the streets of D.C. Sorry cars, it’s our day. D.C. is a city that supports runners, and I am so proud of that. People came out in pouring rain to cheer for regular everyday people who were running around town. It was quite moving to observe. The run thins significantly in the last 13.1 miles, as the majority of people run the half-marathon distance. This increase in personal space gives the full marathoners more physical space, and for me that leads to more head space. I was really able to get in my head during this event. I thought about my family, my parents, the rain and the puddles, my life with Felkerino in the city, and what a gift it was to be a runner on Pi Day. I was on the brink of big-time tears from all this contemplation and it started to overwhelm me. I forced myself out of my head so that I wouldn’t start sobbing with all of these emotions in front of all these runners who I didn’t know and pulled my mind back to concentrating on my feet splish-splashing over the pavement. My friends Jerry and Carolyn were out to see me in the early miles, along with Felkerino, and Felkerino met me and cheered as I crossed the finish line. My final time was 4:30:31, but it didn’t seem like I had been running that long. We rode bikes home together. Some days you get lucky; everything works and the body cooperates. The mental space is conducive, and you have a good run. I never anticipated feeling so great on such a dreary day, but I did. One week before my birthday– I’d call it an excellent early birthday present. Errandonnee 2015 Blog Highlights and Blogroll! Congratulations! 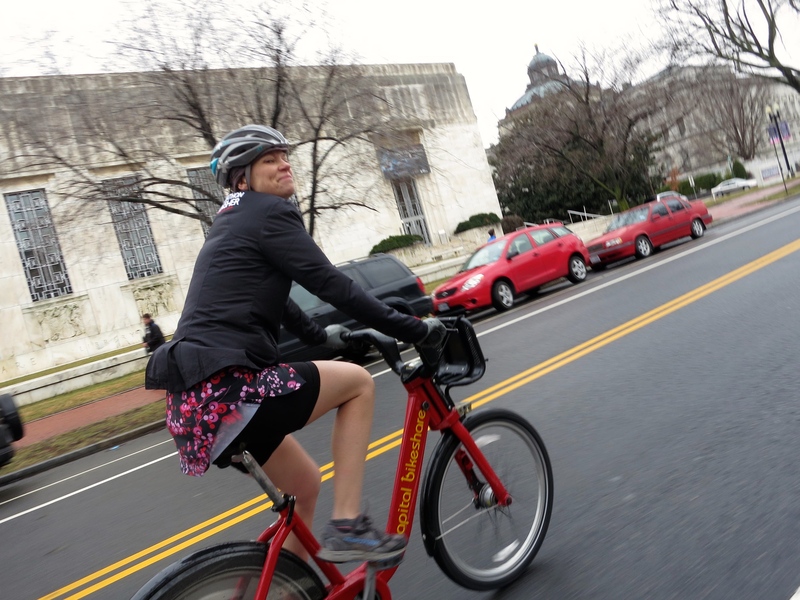 What a great accomplishment–and especially to follow it up with a 60-mile ride the next day. LOVE reading your enthusiasm in this!! Congrats! 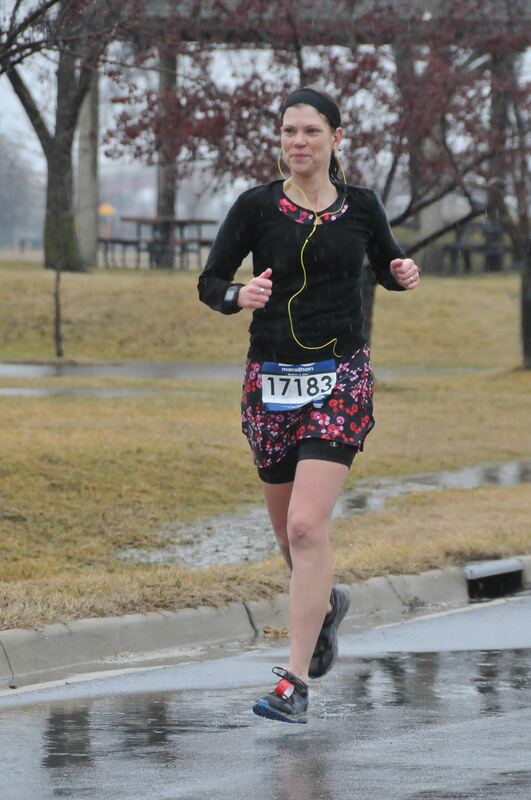 love that photo of you running in your “dress” and shorts. you are so dang classy. Congrats! That was quite a wet marathon but Malinda finished!